You probably never wanted a Ford Aerostar when they were new, but one look at today’s Nice Price or Crack Pipe AWD edition and you may just be wanting one now. That is, if its price makes this Aero a supernova. Have you ever gone to try on a pair of shoes only to discover upon opening the box that someone had already laced them up and had removed the little crumpled wad of paper from the toe? You just know that what followed was the shoving of a cheesy hoof in there—ugh! That means you have to search for another, untried pair in your size—double ugh! Damn those that got there first, and damn too your uniquely proportioned but undeniably handsome feet! You likely feel that same sense of disappointment when you open a box of chocolates only to find that half of the delectable treats show the unmistakable mark of test bites by a previous sweet tooth. Sigh. With yesterday’s silver 1987 Volvo 245 DL you wouldn’t necessarily have to feel that you were getting the sliver medal in life. That’s because while it was a two-owner car, it sported a mere 128K under its tires and showed no appreciable evidence of those that came before. Stout and showy however, were not enough and at $14,500 that almost-new looking Volvo went down in an old school 73 percent Crack Pipe loss. It doesn’t seem all that outlandish—or all that difficult—to maintain a Volvo 200-series in pristine condition, but what about doing so to that bastion of ‘90s suburbia, the minivan? Here then is something that’s really surprising to see: a 1997 Ford Aerostar AWD that presents as remarkably clean rather than as a septic tank on wheels as one might reasonably expect. I find it amazing that it hasn’t fallen apart over all this time. I also find it a remarkable revelation that Ford was still building the Aerostar as recently as 1997. The Aerostar was Ford’s second attempt at a “garageable” people carrier, the first being the cab-over Econoline that rode on the Falcon platform in the early sixties. The Econoline grew with each successive generation, making room for Ford to introduce the compact Aerostar below it in 1985. The new model was Ford’s answer to the Chrysler minivans, but shared genes with the Ranger mini-pickup and Bronco II trucks and hence went RWD instead of FWD. This owner-offered, Jewel Green Metallic over silver ’97 features Ford’s E-4WD which uses an electro-magnetic center diff to parse power between front and rear wheels when needed. The system was designed for slippery road conditions, not off-road excursions, and hence the van rides on seven slot alloys wrapped in street rubber. Power here is made by way of a 4.0-litre, 160-horsepower V6, while transmission duties are performed by Ford’s 5R55E five-speed automatic with overdrive lockout via a stalk tip switch. This was the only drivetrain available in the AWD Aerostar. This is an XLT model so it’s seemingly well kitted for its time. There’s A/C and cruise control, plus power windows, mirrors and door locks. Seating for seven passengers is provided with captain’s chairs (Arr, Matey!) in the first and second rows, and a bench in the back. A quaint blast from the past, the Aerostar never offered a driver’s side slider. Hell, its successor, the Windstar didn’t offer that now common convenience until its second generation. Instead everybody in back has to pile in and out on the curbside. No stepping out in traffic for you, kiddies! There’s only 116,000 miles on this Aerostar and the ad claims—in all caps nonetheless—that it “RUNS GREAT” and is a “MUST SEE.” The paint and interior are in great shape outside of some scratches on the rear bumper and some grunge on the steering wheel. The title is clean and if you’re asking what’s the hitch, it’s right there, under the back bumper. Okay look, I know that YOU would probably rather french your sister than be caught dead in an old Aerostar, no matter how nice of condition. Still, there are people who love these things. In my neck of the woods you’ll see a ton of these still running around as they seem to be the vehicle of choice among certain contingents of the Latino community. The best part here is that this Aerostar could be yours for just $2,450. That’s chicken feed and seems to me to be a lot of minivan for mini-money. Of course, that’s just like, uh... my opinion, man. 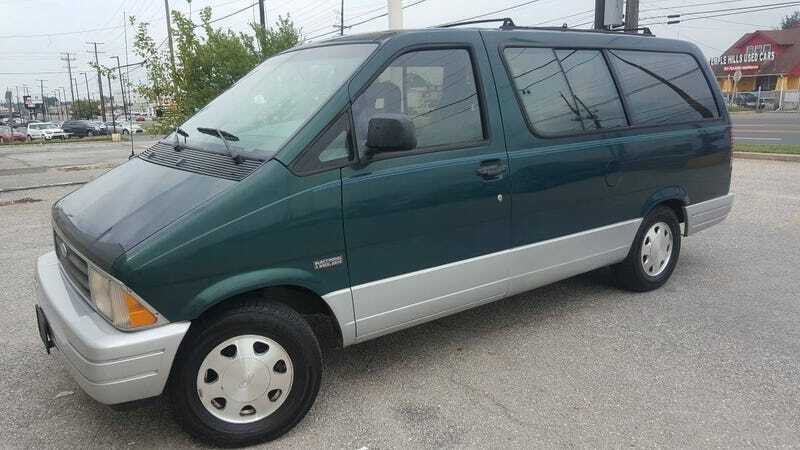 What do you think, does this well-kept old Aerostar feel like a deal at that $2,450 price? Or, for that much would you expect a brighter star? H/T to Josh (no Kinja) for the hookup! Could This Amazingly Clean 1987 Volvo 245 DL Really Be Worth $14,500? Wow, Would You Pay $8,000 For This Custom 1998 Honda Odyssey?